The demand for the establishment of a Constituent Assembly was first embodied in a resolution of the Indian National Congress passed at its Faizpur session on December 8, 1936. The same demand was further raised by the provincial legislatures where the Congress had a majority. But this was all one-sided. The British rulers were not yet prepared to entertain the demand. It was during World War II and under the stress of international conditions that Sir Stafford Cripps was sent over to India to win over the support of Indian political leaders. The proposals of Sir Cripps contained provisions for setting up a body for preparing the Constitution of India after the termination of the War. The proposals of Sir Cripps were not accepted by the Indian political parties. Later in 1946, the Cabinet Mission came to India and put across a proposal for the setting up of a Constituent Assembly. 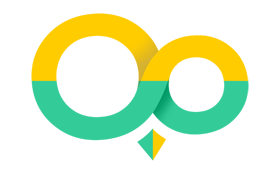 The proposal was accepted by the major political parties in India. Members of the Constituent Assembly were elected on communal basis indirectly by members of the provincial legislatures through the method of proportional representation and single transferable vote. Seats were allotted to the various provinces and communities. The Constituent Assembly thus created had 389 members in all, including 93 representatives of the Indian States. The first meeting of the Constituent Assembly was held on December 9, 1946, under the chairmanship of Dr. Sachchidanand Sinha, the oldest member of the Assembly. On December 11, 1946, Dr. Rajendra Prasad was elected its permanent Chairman. The Muslim League boycotted it. The work of the Constituent Assembly was seriously handicapped. It held several sittings, but die work of constitution-making made little headway. The situation in the country deteriorated seriously. Communal riots broke out throughout the country and the whole situation culminated in the sad partitioning of the country in accordance with the Mountbatten Plan of. Tune 3, 1947. The Constituent Assembly minus the Muslim League members restarted the work. The Constituent Assembly of India then consisted of about 300 members, including the representatives of the states acceding to India. The Constituent Assembly, as established in 1946 according to the Cabinet Mission Plan, was not a sovereign body. Its authority was limited both in respect of basic principles and procedure. According to the Indian Independence Act of 1947, the Constituent Assembly became a sovereign body and all other limitations imposed upon it under the Cabinet Mission Plan were lifted. The method which the Constituent Assembly adopted was to formulate first its objectives. This was done in the form of an “Objective Resolution”, moved by Pandit Jawaharlal Nehru on December 13, 1946. The resolution was, however, adopted by the Assembly on January 22, 1947. The objectives of the Constituent Assembly were: India was to be the independent Sovereign Republic in which both British India and the princely states were to be included. Each unit was to be given a certain amount of autonomy as well as residuary powers. All authority and powers of the States were to be derived from the people who were to be guaranteed freedom of economic and political justice, equality of status and equality before the law. They were to be guaranteed freedom of thought, vocation, association, expression, belief, faith, worship and action subject to law and morality. The minorities, the backward, and tribal people were to be provided adequate safeguards. Drafting Committee to prepare a draft constitution. The committee consisted of eminent constitutionalists like Dr. B. R. Ambedkar (Chairman), Sir Alladi Krishnaswamy Iyer, N. Gopalswamy Ayvangar, Syed Mohammad Saadullah, T. T. Krishnamachari, Dr. K. M. Munshi, etc. Dr. Rajendra Prasad was elected President of the Assembly. The Constituent Assembly took two years, 11 months and 11 days to complete its work. It concluded its work on November 26, 1949, when the Constitution was signed at an impressive ceremony. 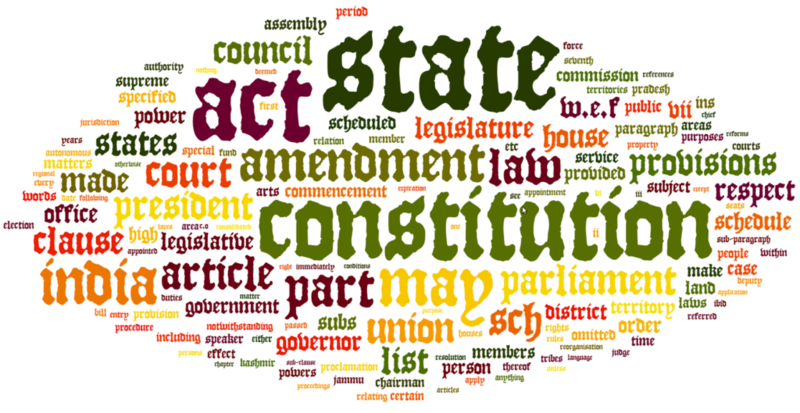 Some provisions of the Constitution like citizenship, elections, etc., were brought into operation at once but the rest of the Constitution came into force on January 26, 1950. The original Constitution is a voluminous document containing 395 Articles and eight Schedules. A number of other Articles and Schedules have been added by some constitutional amendments made thereto since its promulgation. (i) Debates of the Constituent Assembly : The debates of the Constituent Assembly are a good source of the Indian Constitution. We can understand the wishes and aspirations of our Constitution-makers by reading these debates. (iii) Opinions of the Constitutional Jurists : The commentaries which have been written on the Indian Constitution by the Indian and foreign writers, like V. N. Shukla, D. D. Basu, Gledhill, W O. Douglas and Alexandrowic, are also a very good source of the Indian Constitution. (iv) Enactments of the Indian Parliament: The Parliament of India has also passed several Acts to clarify certain constitutional matters like delimitation of areas, boundaries of States, the decision on the numerical strength of the Lok Sabha, etc. These Acts also form a part of the Constitution. (v) Decisions of the Judiciary : The decisions of the Supreme Court and the High Courts are also an important source of the Constitution. These decisions interpret the Constitution and throw a lot of light on its provisions. The judicial decisions thus help in understanding the Constitution. (vi) Foreign Decisions : The decisions of the foreign courts like the Supreme Court of the United States of America and Privy Council of the United Kingdom also serve as good sources for understanding our Constitution. 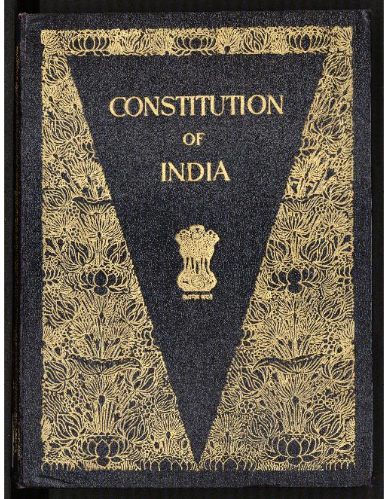 (vii) Conventions and Usages of the Constitution : Although the Constitution of India is a written constitution, certain conventions and usages have been developed in our country. In reality, the parliamentary type of government in our country is based on the conventions and usages as prevalent in the United Kingdom. (i) The office of the President of India is based upon that of the British Queen who is the nominal head of the state. (ii) The Cabinet system of government in India is based upon the Cabinet system as prevailing in the United Kingdom. (iii) Our Prime Minister is also a replica of die British Prime Minister. (iv) The parliamentary type of government has also been adopted from the British system. (v) Just like the United Kingdom, our Parliament is also bicameral, i.e., it has two Houses, the Lower House, and the Upper House. (vi) The Lok Sabha, the Lower House of Parliament of India, is as powerful as the House of Commons. (vii) As in the United Kingdom, the Council of Ministers is mainly responsible to the Lower House, i.e., the Lok Sabha. (viii) Like the United Kingdom, the presiding officer of the Lok Sabha is also known as die Speaker. Some of his powers resemble those of the Speaker of the House of Commons in the UK. (ix) The privileges of members of Parliament in India are also based on their counterparts in the United Kingdom. (i) Our Constitution is a written one like that of the United States. The concept of a written Constitution has been adopted from the Constitution of die United States of America. (ii) The federal system of government in India is influenced by the American Constitution. (iii) The Fundamental Rights in our Constitution are inspired by the American Constitution. (iv) Like the American head of state, our head of state is also known as President. (v) Like the American Constitution , we have also made a provision for Supreme Court of India. (vi) Our provinces are known as States after the American Stance under the Constitution of the United States. (vii) Just like the Senate of the Initial States, the Rajya Sabha in India again represents the States. Constitution of Canada : From Canada, we have borrowed the scheme of federation. Influenced by the Constitution of Canada, India is also known as a “Union of States” and as “United States of India” as is the cast with United States of America. Constitution of Ireland : From Ireland, we have adopted the concert of Directive Principles of State Policy; Ireland itself had borrowed the is principles from the Republics. Constitution of Spain.